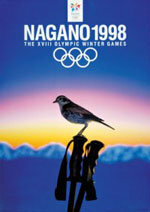 With over 2300 competitors from a total of 72 nations, the Nagano Winter Olympics were the biggest ever. Curling and snowboarding were new sports while women competed at ice-hockey for the first time. Tara Lipinski, only fifteen years old, won the figure skating. The Dutch woman, Marianne Timmer and Gianni Romme, won two gold medals each for skating and set new world records. Hermann Maier had a bad fall in the downhill but later won gold medals in both super-G and giant slalom. The Norwegian effort was amazingly successful: 10 golds, 10 silvers and 5 bronzes. Bjørn Dæhlie won three new gold medals, and with a total of eight victories he is the greatest Winter Olympic champion of our times.